There’s an island 30 miles off the coast of England that the locals call 'The Forsaken Isle'. The once bustling port city is now said to be home to ghosts, necromancers and dangerous man-eating wolves! Such nonsense can’t hold any merit, right? After hiring a local boatman to take you to the island, you start to question the rational world you thought yourself a part of. Confront an evil warlock, a vicious pack of wolves and other dark forces to escape with your life! Wallpapers, concept art, and music too! 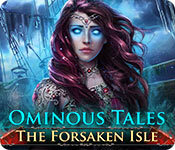 Ominous Tales: The Forsaken Isle is rated 3.9 out of 5 by 16. 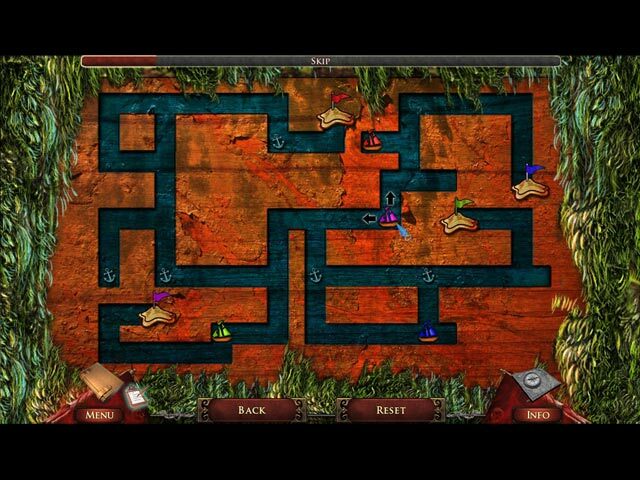 Rated 5 out of 5 by worlockslady1 from Great game. Glad I Played It. Well thought out and put together game. Mini games were fun and not all your same old-same old. This really moved along great and if you end up not sure what to do next, the map is a help. Good story with a great ending. Rated 5 out of 5 by bjdjtjbjd from Do NOT pass this one up!!! I truly enjoyed this game. I did NOT get tired of playing it...it was NOT the back and forth gameplay like most of the games. You even have a custom level to skip all the puzzle games that you don't like. I have said time and time again...I hate most of them and asked the Devs to give us the choice to go to HOG instead of the puzzle games. They have NOT listened to me as of yet. There is NO cons about this game to tell you about...just plain enjoyable. Has a great ending as well. Rated 5 out of 5 by jocasta1 from Love it! This is a great SE game! It plays with a nice level of challenge on the "expert" setting, and the graphics are amazing...I particularly like the notes that reflect the action as the they are being read! The plot and the voice overs are good and the demo just flew by! Try it! Rated 5 out of 5 by biscuitsmama from CAN YOU RELEASE THE LADY ANNABELLE? You have been having nightmare recently and often wake up in a cold sweat as you feel your ancestor the Lady Annabelle Stark calling you to release her from her torment. It is not long before you realize that you must go to the Forsaken Isle to research your past and the Lady Annabelle who mysteriously disappeared, never to be seen again. It is not very often that BFG presents a new and very good SE HOPA game during the week. Ominous Tales the Forsaken Isle is a very good game that was most likely meant to be a CE but for some reason was released as an SE. Aside from the missing Strategy Guide and Bonus Game everything else is here including collectibles, wallpapers, concept art, music, and stories. 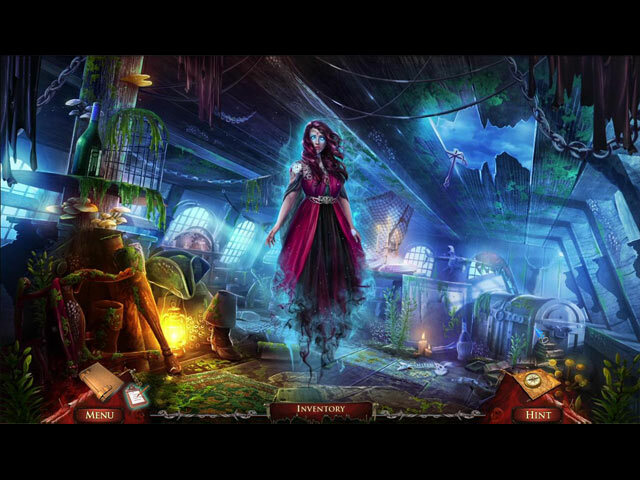 The graphics are good and colorful in spite of the dark theme of a ghostly mystery. The game offers a custom mode of gameplay but there are not many options available so you will need to turn off the tutorial early in the game if you don’t need the extra help. You will find a transporter type map early in the game that will show where you have current tasks available. The HOPs are well done and some are quite lovely although they are fairly basic with minimal interaction required to find some items. Even though we might visit the same HOP more than once the style will generally change. Revisiting HOPS has never been something that bothers me but I know many gamers don't like it. Fortunately the scenes are easy on the eyes with gorgeous graphics. The puzzles are good and some are a bit challenging. I happen to dislike the puzzles where spinning or turning one thing changes other adjacent items and there is one of those puzzles fairly early in the game. Since it drove me nuts fairly quickly it didn't take long to become a skip for me. Fortunately there were other excellent puzzles that I enjoyed solving without the frustration level tagging along. As noted above the game has a lot of the extras found in CE games so it became a nice bonus game for me. I always struggle to find games that I like where I can use my free coupons so today’s surprise became an instant addition to my gaming library. Although I like the game and the storyline there were moments when the gameplay seemed a bit clunky but not enough to prevent me from enjoying the game. I like the storyline of the Lady of the Isle and her lost love. The bad guy Victor is certainly an evil madman and one you must defeat in order to release the Lady Annabelle. As always, I suggest you try the demo to see if you will enjoy the game. Rated 5 out of 5 by pennmom36 from Aarr....Tis A Pirate Ghost Story...And A Good One At That! Thirty miles off the coast of England, lies the infamous Forsaken Isle. Folks around here know that once you step foot upon the island, you will never return, because this island is home to ghosts, necromancers, and man-eating wolves. It is also home to Lady Annabel and her star crossed lover Vincent. Lady Annabel has been coming to you in your dreams, begging for your help to escape her never ending torment. And of course your curiosity compels you to the Forsaken Isle, but you know what they say about curiosity killing the cat, will you be the Isle's next victim? This is a fantastic Standard Edition game, with decent graphics and voiceovers, not to mention all of the extra content available. There are 8 collectible pages from Annabelle's Diary, 9 Tormented Souls, 12 Claw Marks and 8 Character's Biography pages to unlock. There are also Wallpapers and Concept Art offered. 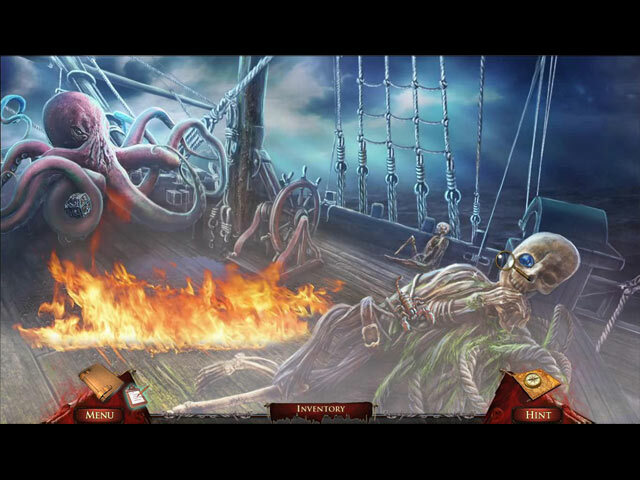 The Hidden Object Scenes are good, but they are repeated in the same scene, usually with a different type, like an Interactive List find followed by Silhouetted Shape finds. This game does allow you to skip the HOP's which is a rarity in most adventure games. I thought the graphics were less clear within the HOP's than in the main game. The Mini Games are actually fun and not too easy or difficult. Below are brief descriptions of some of the games you'll encounter during the demo: 1) Swap horizontal tile strips to recreate a picture. 2) Use directional arrows to guide several color coded ships to their matching ports using anchors and other ships as bumpers. 3) Rotate the ships wheel using the center symbol as a clue to turn the wheel in the correct direction and the correct number of revolutions. This may only be a Standard Edition version, but it has a lot of extras including 8 Character Bios, 9 Tormented Souls, 8 Annabel's Diary Pages, 12 Claw Marks, 10 Concept Art Pictures, 10 Wallpapers, and 3 Music Soundtracks. I didn't hesitate to use a coupon for this little gem, it's well worth it, enjoy! Rated 4 out of 5 by ninja226 from Forsaken love dooms an island A very nice game, but really short, even with extras thrown in. Expert mode allows Hint, Skip, map indicators of sites with active tasks, and tutorial. Even so, it had enough challenge to make it interesting. Most of the puzzles are easy, but the steering wheel one really stumped me. Also aligning the wolf head so the beams of light point in the center was such a pain, I skipped. HOPs are standard variety and not terribly imaginative, but there weren't enough of them. That would have extended the game a bit. For a standard game, it comes with extras normally seen with collector editions. There are three collectables (claw marks, tormented souls, and Annabel's diary pages). You also get wallpapers, replayable music clips, concept art, and Stories. The "stories" is actually pretty good and sums up each character's biographies and the overall story framework, illustrated beautifully and not too long to read. The artwork and voiceovers for this game are outstanding. The story is haunting, but easy to follow. The Lady Annabel is a sympathetic figure and your guardian in your journey. Really liked this game, wish it had been longer. Rated 4 out of 5 by alphafem from EXCELLENT POTENTIAL.....but This had all the ingredients of a Five Star SE, but it just wasn't developed far enough. It is the first game I have come across by this particular developer (Urchin Games), and they were sooo on the right track. Other reviewers have done a great job of explaining the Storyline, so I won't re-hash it. I found it to be excellent. The graphics were awesome, except the exterior of the mansion. What happened!!! As an architecture freak I was sorely disappointed! It looks like they forgot to finish it! I'm not kidding! (Hence the 4 on Visual Quality) The game is short, with only 13 locations, but they were all pretty interesting. There were collectibles, and an additional story line book. The journal kept Annabel's diary, plus additional notes. As I mentioned earlier, the devs were on the right track with this. It just seems like somebody pulled the plug on production before they actually finished what they set out to do. What there was of it, was enjoyable. Use a coupon. Enjoy! Rated 4 out of 5 by cowclaudia from Passably good game Found it rather short but enjoyed playing it. Music was quiet and not distracting, puzzles for the most part I skipped, hidden objects were easy to find and all in all an easy game to pass the time when wanting a break from more complicated games. Rated 4 out of 5 by bobbysian23 from Very good, but unfairly short! The problem with the people who review a game after just the demo is that you can never get a full sense of the game. This game was great, but.....it was ridiculously short! I completed the whole game in 1.5 hours. The game had such potential and reminded me of the Midnight Mysteries series which I love. Definitely recommend it, but use a free game token because its not worth spending money on. Such a shame! Ghosts, necromancers and dangerous man-eating wolves lie in wait on the Forsaken Isle. Will you still go and save Lady Annabel?